One of the most popular sweet treats this time of year is Chocolate Covered Strawberries. You can find them at every candy store, grocery store and even at the local florist shop. Homemade Chocolate Covered Strawberries drizzled with even more chocolate. There is even a company that specializes in delivering cold, chocolate covered strawberries to your loved ones. Chocolate covered strawberries are not only delicious, they are also a beautiful dessert. 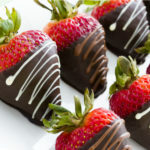 Although you can add all sorts of toppings, even the basic combination of chocolate coated strawberries are impressive. Plus, they taste so good! The sweetness of a fresh ripe strawberry goes perfectly with the bitterness of the chocolate coating. 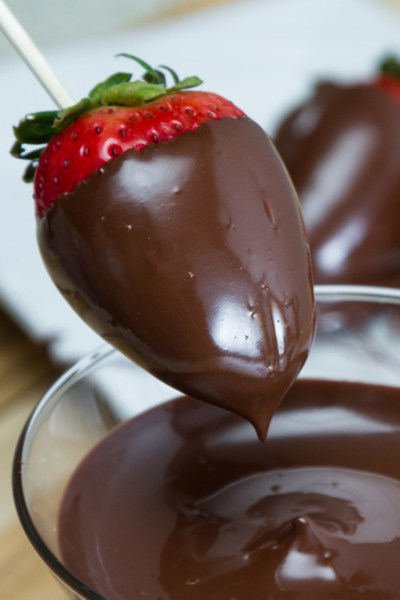 Be sure to wash and completely dry the strawberries before dipping them in the chocolate. And best of all….they are super easy to make! They only require two ingredients and within 20 minutes you can have a baking sheet full of these delicious dessert bites. Have you ever taken a look at the beautiful chocolate covered strawberries at the store? Do you wonder why yours don’t look quite as beautiful when you make them at home? There are a few things that commercial establishments do to make their chocolate covered strawberries look flawless. Slowly met your chocolate in either a double broiler or at 50% power in the microwave. First of all, they use the largest, most perfectly shaped strawberries. They pick out the best strawberries so that they turn out uniform and beautiful each and every time. But they also use additives in their chocolate. These additives make the chocolate super smooth and shiny once it hardens. There are no extra streaks of chocolate wrapped around the outside of the strawberries. And the back side looks just as good as the front side. But don’t worry, there are a few things that you can do to make the best homemade chocolate covered strawberries right in your own kitchen! Place the strawberries on wax paper to harden. Because you only have two ingredients to work with, each one is very important. First of all, picking out the right strawberries is crucial. You want to use strawberries that are at their peak of ripeness. 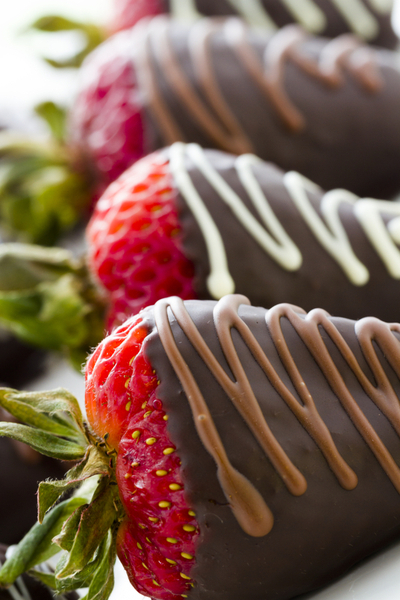 Over-ripe strawberries are no longer firm and can’t withstand being dipped in chocolate. However, under-ripe strawberries lack the flavor needed to make this dessert outstanding. Look for the package of strawberries that are nice and red, but without any mushy strawberries at the bottom of the package. 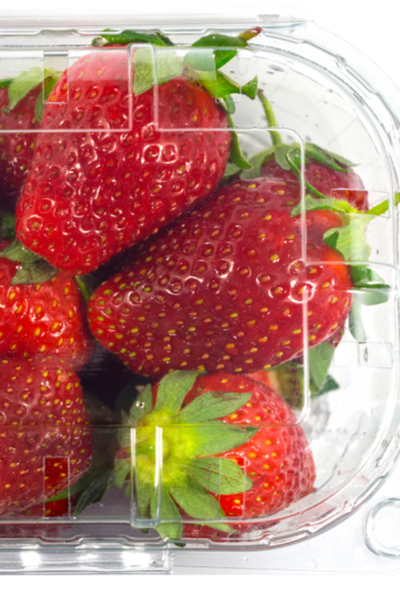 Turn the package of strawberries over to see if they are over-ripe. Now it comes to picking out the chocolate. There are so many options, and each one will give you a slightly different taste and texture. I have found that baking chocolate produces the best, and most consistent results. And I will take it one step further. Buy good, quality chocolate. If you truly want to make beautiful and delicious chocolate covered strawberries, than this is not the time to use the generic baking chocolate. Just keep in mind that it is always a safe bet to buy chocolate that is made from a quality chocolate company. Keep the strawberries cool until ready to be served. Now that you know what type of chocolate to buy, which flavor is the best? If you look down the baking aisle, you are probably going to find bittersweet, semi-sweet and milk chocolate flavors if not more. I prefer to dip my strawberries in semi-sweet baking chocolate. It provides the best balance of flavor that resembles those made in the candy store. But of course, you can use whatever you prefer – it’s your special treat! And if you are looking for another chocolate dessert be sure to check out our easy to make Instant Pot Lava Cakes! Classic chocolate covered strawberries are a quick and easy dessert idea that everyone loves. Dress it up a little by drizzling white chocolate on top or coat your chocolate covered strawberries with toppings of your choice. 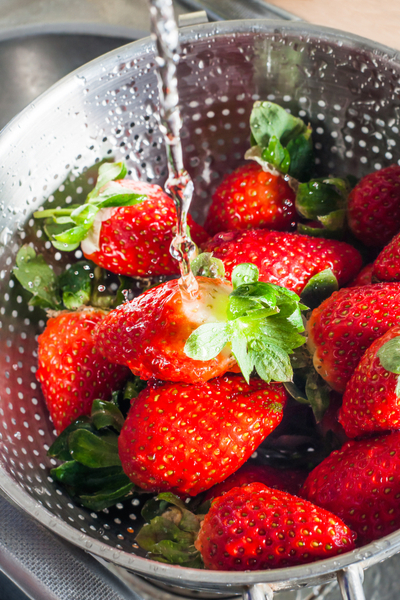 Start by washing the strawberries and then drying them completely. 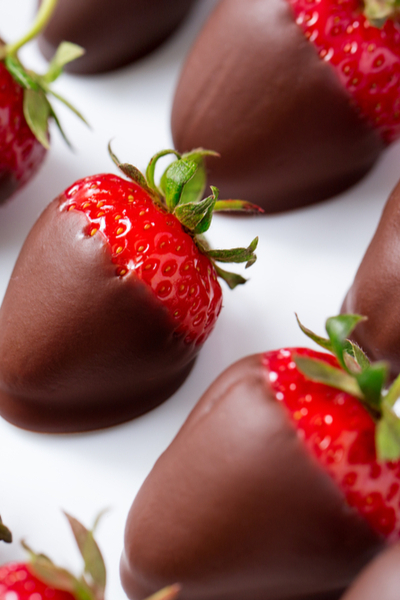 *Note – if the strawberries are damp, the chocolate will not adhere to the strawberries. If you are going to dip the chocolate covered strawberries in a topping (ex. Coconut, peanuts, sprinkles, etc.) now is the time to prepare those. Place each topping on a small plate. In the bottom pan of a double boiler add about an inch of water, being sure the water does not touch the top pan. Remove one tablespoon of chocolate chips and set aside. Add the remaining bag of chocolate chips to the top pan. Heat the double boiler over medium-low heat and stir until chocolate is melted completed. Remove the bowl and stir in the reserved tablespoon of chocolate chips. Remove one tablespoon of chocolate chips and set aside. Pour chocolate chips into a medium size microwaveable bowl. Microwave the chocolate on 50% power for 30 seconds. Stir and place back in the microwave at 20 second intervals, stopping when the chocolate has just melted. Once all of the chocolate has melted, remove the bowl and stir in the reserved tablespoon of chocolate chips. Holding a strawberry by the stem, dip it into the chocolate, lift and turn it slightly so the excess chocolate drops off. If you are using any other toppings, roll the chocolate covered strawberries in the prepared toppings. Place the strawberries on wax paper to cool and harden. To drizzle white or milk chocolate over top of the chocolate covered strawberries, melt the chocolate in the same manner that you did previously. Dip a fork in the melted white or milk chocolate and drizzle it over the coated strawberries. 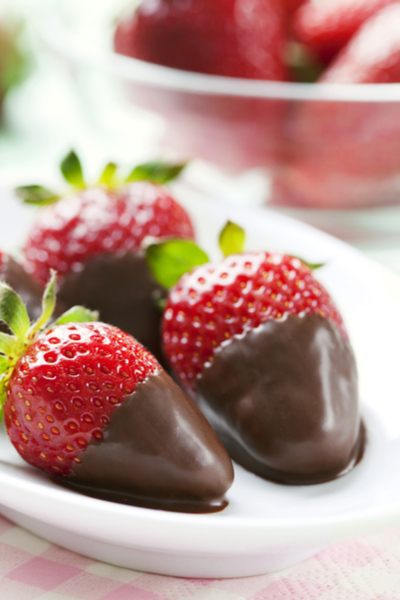 Place the tray of strawberries in the refrigerator for 15 minutes, or until the chocolate hardens. It is best to eat the strawberries on the day that you make them. However, they will store in a refrigerator for up to 2 days.